Thatch is a build up of rhizomes and stolons between the crown of the grass plant and the root. Grass clippings left neatly on the lawn do not contribute to thatch build up. (see “mowing”). Some thatch is necessary a nd advantageous to maintaining a healthy lawn. When the thatch becomes thicker than ½ inch it is detrimental to the health of the lawn. Thatch tends to become hydrophobic as it thickens, actually repelling water and nutrients needed in the root zone. Heavy thatch is also a breeding ground for detrimental insects such as chinch bugs and sod web worms. 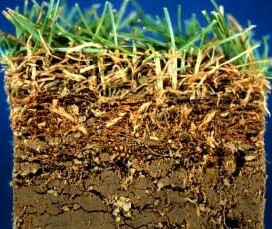 A heavy thatch layer can impede the movement of insecticides into the soil for the control of soil inhabiting insects such as grubs. Blue grass reproduces and spreads by rhizomes or underground lateral stems which grow out underground from the mother plant to form a new plant next to it. A thatch build up of more than a half inch is expected in a healthy blue grass lawn, however to maintain vigor some thatch reduction must occur. Some grasses reproduce by stolons, or above ground lateral stems that extend from the mother plant to the offspring. Please maintain a healthy soil environment for earthworms. Earthworms work daily at thatch reduction as well as soil tilth. Avoid certain pesticides that inhibit earthworm activity. Maintain proper soil pH. Keep your earthworms happy. De-thatching lawns in spring is still quite common. Unfortunately such a small percentage of thatch is removed that it hardly seems worth the effort. Thatching is very labor intensive and creates an inordinate amount of material to be hauled to the land fill. Top dressing is another method of reducing thatch in the lawn. A thin layer of soil or leaf mold type material is spread over the grass in such a way that the blades of the grass push through and continue to grow. Beneath the top dressing the thatch gradually breaks down and is used as nutrients for the grass plants.